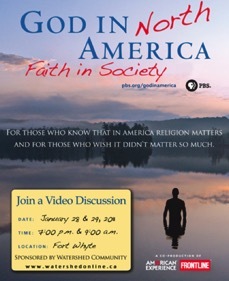 In just over two weeks we'll be hosting a Video Discussion on the PBS series, God In America, on Friday January 28th and Saturday January 29th, at Fort Whyte Centre. This program explores how religious liberty shaped our continent, and seeks to foster understanding as a way towards dialogue. The series is geared for those who know that in America religion matters, and for those who wish it didn't matter so much. We will be viewing the first 2 hours of this 6 hour PBS series: A New Adam which explores how the desire for for religious freedom inspired hope for a new humanity, and A New Eden which traces how the pursuit of liberty inspired political hopes . We will have our usual starter questions to get the discussion going, and explore some of the background issues through presentations and drama. There will be snacks and some recreation time as well. Examining the complex interaction between religion and democracy, the origins of the uniquely American concept of religious liberty, and the controversial evolution of that ideal in the nation’s political arena, GOD IN AMERICA considers the role religious ideas and institutions have played in social reform movements, and how guarantees of religious freedom created a competitive religious marketplace in America. The series explores its themes through a series of emblematic stories of the country’s religious history, and the political and spiritual journeys of important historical figures including the Pueblo leader Po’pay, Puritan leader John Winthrop and dissident Anne Hutchinson, early evangelist George Whitfield, Catholic Bishop John Huges, abolitionist Frederick Douglass, Presidents Thomas Jefferson and Abraham LIncoln, Methodist circuit rider James Finley, Reform Rabbi Isaac Meyer Wise, Presbyterian biblical scholar Charles Briggs, Scopes trial combatants William Jennings Bryan and Clarence Darrow, evangelist Billy Graham, civil rights leader Martin Luther King, Jr. and the Moral Majority’s Jerry Falwell. What is the essence of religion? How would you describe Winthrop's Puritan vision of human community? How attainable do you think it was? What would be modern examples of the characters portrayed in the series? How did the Puritan religious community define itself? How does it compare to today's religious communities? What did conversion mean for the Puritans and what does it mean today? Has it changed? Why? How does our Canadian history of religious experience resonate with the American version? How is it distinct? Discuss how freedom of religion allowed ordinary people to take charge of their religious (or non-religious) life? How do you relate to the experiences described in 'God in America'? What are the enduring themes? Does viewing this history make you more grateful or more cynical? Why? What are the regular practices, religious and/or spiritual, that you have made a part of your life? How do they impact your life? Do you make a conscious effort to live accordance with your spiritual values or religious beliefs? One enduring theme of the series is the growth of the 'wall of separation between church and state'. What are its benefits? How does it complicate life? Is there a solution? Revivals and camp meetings followed the expanding American frontier. How and why do you think evangelical revivals brought attention to social reform as well as individual piety? Historian Stephen Prothero observes at the end of episode two that despite examples of the denial of religious liberty, the America story "is always working on us." Do you agree? What evidence can you cite that this might be so? The intellectual Thomas Jefferson and the evangelical Baptists of Virginia set aside their differences and together defended a belief they shared: the right to worship freely. Why does Jefferson argue for religious liberty? Why do the Baptists? How do religion and spirituality complement one another? Do strong religious practices deepen your spiritual beliefs? Can you have a strong sense of spirituality without religion? Name the four Gospels. List as many as you can. Where according to the Bible was Jesus born? “God helps those who help themselves”: Is this in the Bible? If so, where? “Blessed are the poor in spirit, for theirs is the kingdom of God”: Does this appear in the Bible? If so, where? Name the Ten Commandments. List as many as you can. What are the seven sacraments of Catholicism? List as many as you can. What are the two religion clauses of the First Amendment?